This page features free printable Math Worksheets Printable Quizzes and other scholastic exercises. See the worksheets shown below, then scroll down for more quizzes and worksheets. For a broad assortment of other free printable items, visit any of the links on this page. 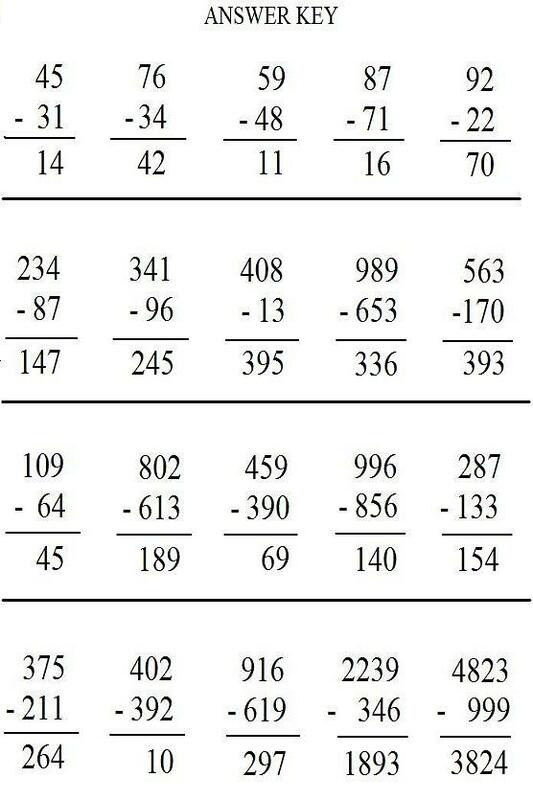 To print out these math worksheets, right click an image below and select a SAVE option from your drop down menu. This will send the image to your picture file. From there you can reduce or enlarge it and adjust the page margins as needed. 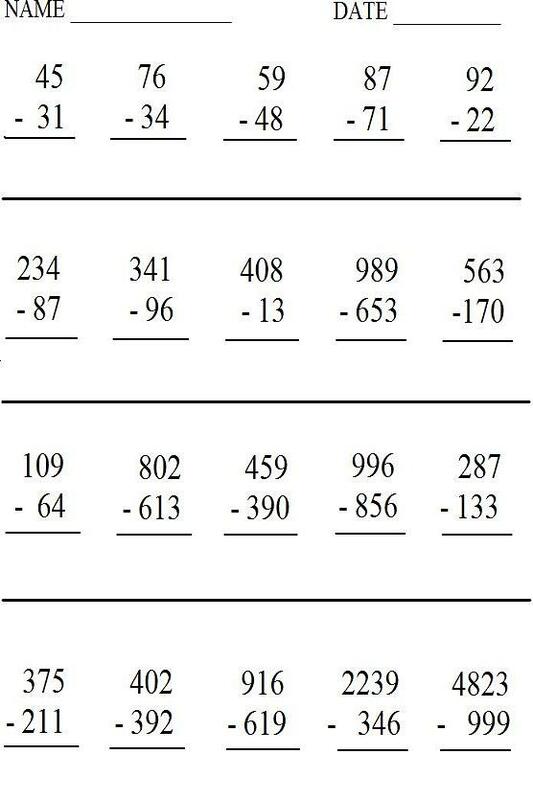 The worksheet shown here deals with simple subtraction at a first or second grade level. The answer key to this problem set is provided below it. Subtraction is one of the four basic arithmetic operations. It is the opposite of addition, and is denoted by a minus sign (-). The result of a subtraction is called the difference. 1. From a given collection, to take away (subtract) a given number of objects. 2. From a given measurement, to take away a quantity measured in the same units. 3. To compare two like quantities and find the difference between them. This is also known as comparative subtraction. 4. To find the distance between two locations at a fixed distance from starting point. Any number whose digits add up to nine is also divisible by nine. Therefore, any number whose digits add up to nine CANNOT be a prime number. The highest prime number yet discovered nearly ten million digits, and is long enough to fill about 3500 pages. Four is the only number in the English language that is equal to the number of letters it takes to spell it. The number thirteen (13) is considered both lucky and unlucky, depending on who you ask. The number 47 is considered to be the quintessential random number, according to a group that calls itself "The 47 Society." When two dice are rolled and their values added together, the most commonly occuring value is seven. Thus, the term "Lucky 7." Visit this link for more Printable Math Worksheets.